I grew up in Alaska. The short summers there have days that never end. And if it wasn’t raining, and the mosquitoes weren’t too bad, we would be out until well past a reasonable bedtime. But when winter came, it was dark and cold. The evenings were long, and perfect for reading books by the dozen. My siblings and I spent hours almost every night, curled up around the wood stove reading or listening while my parents read aloud from book after book every winter of my childhood. Those evenings around the fire served as introductions to some of the greatest men and women who ever lived: missionary heroes. David Livingstone, the abolitionist explorer. Hudson Taylor, the founder of China Inland Mission. Mary Slessor, the brave woman who wasn’t afraid to go alone where Jesus called her. Brother Andrew, the man whom God gave extra courage. 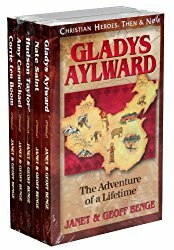 Gladys Aylward, the little woman who was loved by the people she went to serve. Their names were like the names of old family friends. Their stories echoed in my heart long after the last page of the book was read, and long after I grew up and moved away from home. 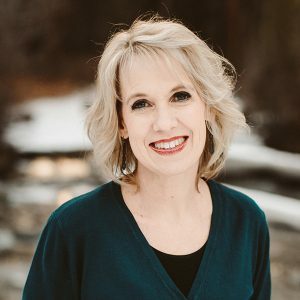 The inspiring stories of missionaries and great faith heroes that my parents read aloud to me during my childhood taught me that God doesn’t call just the exceptionally talented. He doesn’t call just the brave ones to share His truth in difficult circumstances. Instead, He calls the ordinary, common ones like me and gives them exactly what they need to shine where ever He calls them, be it far away in Africa or in their own little neighborhood. I have a home and family of my own now and live far away from Alaska and those long winters. But I often think back fondly to the evenings around the fire. The faithful lives of those missionaries still challenge, encourage, and inspire me. As my daughter grows, I aspire to fill our home and evenings with the same kinds of stories about missionary heroes that I grew up on. I’ve begun filling up my bookshelves with missionary stories so that I can pass on the legacy that these godly men and women left us. 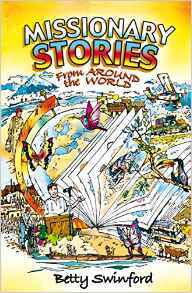 These collections of stories about missionaries from around the world are written especially for children, but adults will enjoy the stories too! If you glance through the titles in the Christian Heroes Then and Now series, you may be surprised at some of the names you see. While many of these books speak directly about great missionaries who spent their lives serving God abroad, these non-fictionalised books offer a good way to get to know the stories of great Christian men and women who served God in many different ways throughout the decades. These books are a little bit different than the first series in this list. 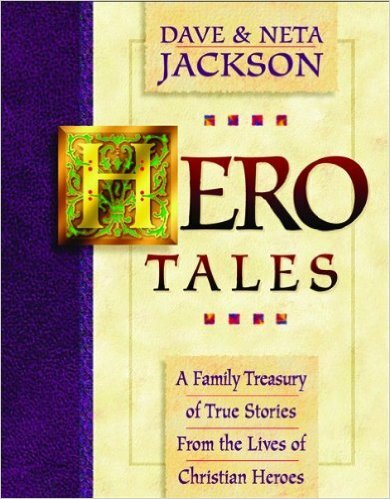 Dave and Neta Jackson have written a series of fictional stories for elementary aged children about some of the great missionaries in Christian history. The actual story is fictional, but the setting and the missionary are real. 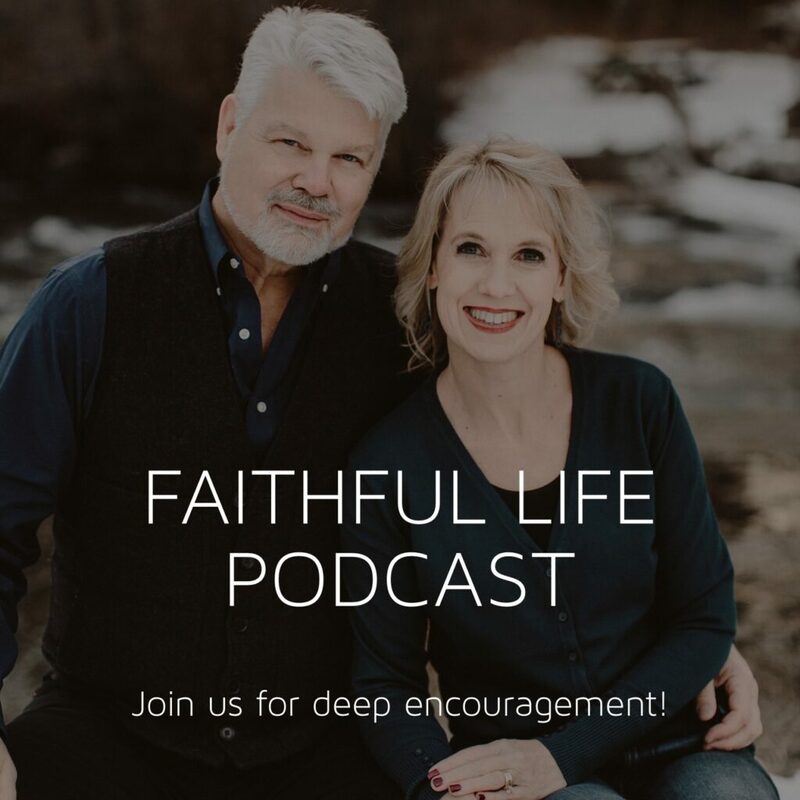 It’s a good way to glimpse the culture and the people that people like David Livingston and Amy Carmichael lived and worked with. The Trailblazer series focuses on the “trailblazers” in the literal sense: the men and women who went ahead and broke the ground for others to follow later. 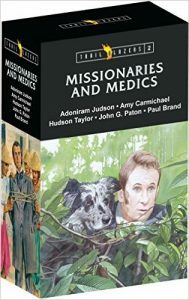 The Missionaries and Medics set is number two in a six-set series that explores the lives of many different kinds of great Christian heroes in all walks of life. 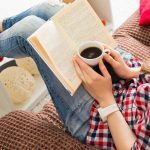 But these five books are not the only books about missionaries in the greater Trailblazer series. There is a good selection of other inspiring stories of missionaries every child should grow up knowing. In fact, any of the Trailblazer books will make an inspirational addition to any young person’s library. 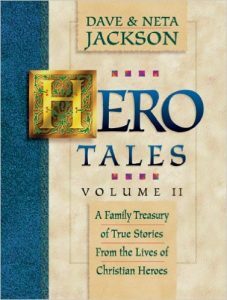 These short chapter books are the perfect introduction for younger readers to some of the beloved heroes of the faith. Each book features 10 stories that are simple to read. Each story is only 7-10 pages long. 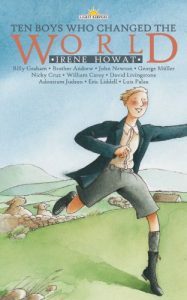 Easy enough for a newer reader, and long enough to give a good overview of each hero’s work and life, these books are a great way to whet your child’s appetite for reading about missionaries. These books are also part of two box sets that explore other great men and women as well. 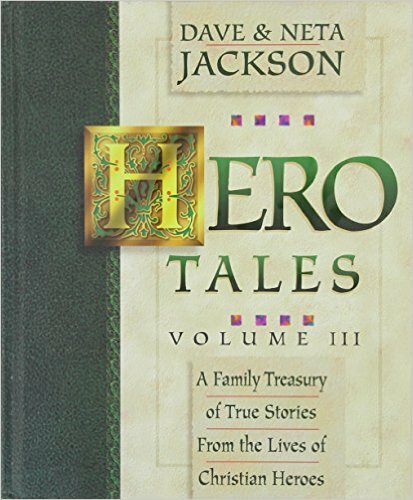 This series of treasury style books features true stories of some of my favorite missionaries and Christian heroes. Each treasury features around 15 different inspirational biographies which give a rounded glimpse into the background. They also reveal the way that each person served God. 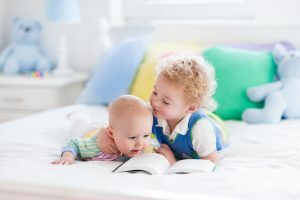 These books offer a chance to tell even our youngest little ones about great missionaries and other inspiring Christian heroes. The simple stories are easy to grasp and make great first introductions to missionary stories for little ones. Do you have a favorite missionary story? I’d love to hear about the missionary stories you love and read! Chantel Brankshire is an everyday kind of girl who loves ordinary life, barefoot days, laundry on the line and fireflies. She is married to her best friend, Scott and together they have redheaded rainbow child, Charlotte who is the joy of their hearts. Chantel is a Virtual Assistant. She writes on Beautiful Song about books and finding joy in ordinary life and manages Adornabelle, the fashion blog that celebrates inner beauty. She dreams of one day owning a berry farm in the country. Awhile ago. I was looking at the 10 Girls…series online, but was disappointed at the price. A couple days later I was shopping at a small thrift store and lo and behold, there was the set of books in perfect condition for less than $5.00. At first I couldn’t believe it, but then realized it was a gift from Father God for me to give to my granddaughter! I will check out some of the other suggestions. Thank you! We enjoyed Missionary Stories with the Millers. Great bedtime reading. This sparked a desire for me to! 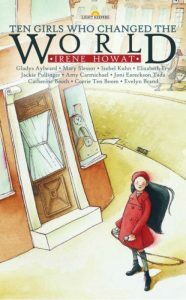 I love the Spire Christian comics of Corrie ten Boom, Cross and the Switchblade, Through Gates of Splendor, and others. Only available on eBay now, I think. Thank you so much for sharing these, Chantel! We love the YWAM series on Missionaries. My son’s favorite was Jim Elliott and mine probably Gladys Aylward. I Love how they are written. They are easy to read but the stories are so interesting and keep you reading far longer than you intented. I cannot begin to tell you how thankful I am for this post. 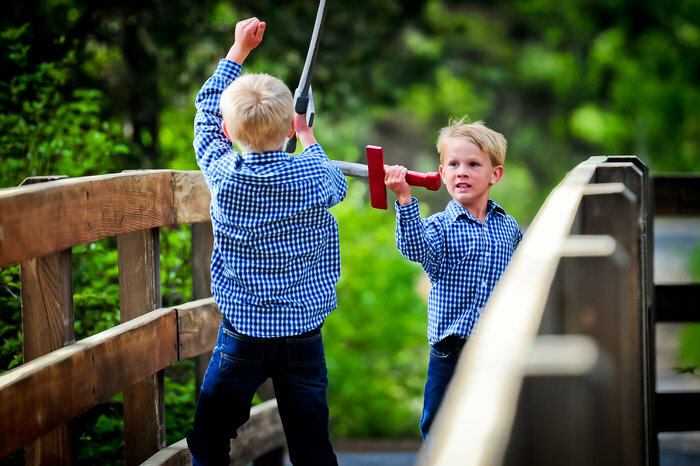 I am a homeschooling mom of two 8 year old twins. I have a heart for missions and I want to open my children’s eyes and heart up to serving those in need around the world. 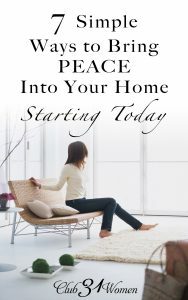 This is the perfect way to begin right in our own living room. 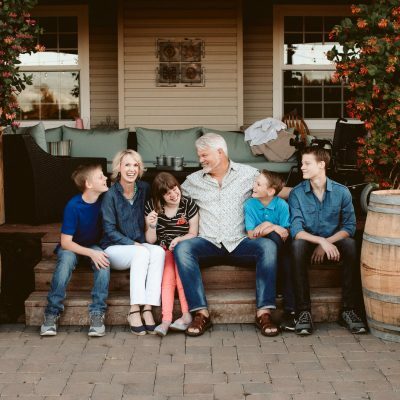 I would also like to know about short term missionary opportunities for families, so that I can expose my children to actual mission experiences before they leave home. Thank you again for this amazing post! I will probably buy every single book you recommended and continue to search out others on my own; George Mueller, for example, Corrie Ten Boom, and others. You have really sparked something here! I’m so glad! 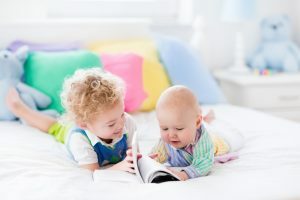 I hope you will enjoy the books and be blessed as a family as you read! My own siblings are both long term overseas, and I know that in part, these books helped their hearts be open to serving God in their new homes! My husband and I are full time missionaries raising our 6 sons at Immanuel Mission in Sweetwater, AZ. We welcome many groups, families and individuals each year to come serve in a third world nation to the Navajo people. The mission here was founded in 1924, and now is a full K-12 Christian school, with many ministries to the community and area. We love to have people come visit and experience missions anytime! The website is http://www.immanuelmission.org, or my e-mail is kbbielecki@ yahoo . com. Our first time here was such a neat experience for our boys, my husband and I have always had a strong heart for missions, serving short term both overseas and on the mainland here, before the Lord clearly opened the doors and directed us here 16 months ago! Our family also LOVES reading, especially missionary stories! 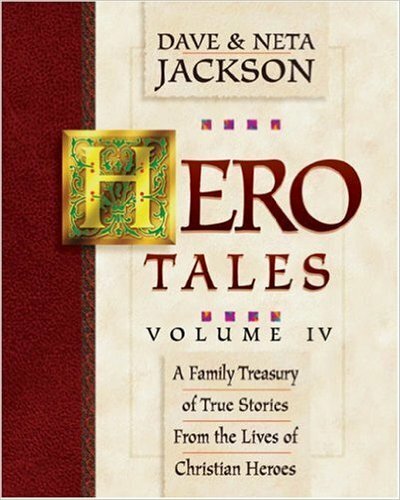 Our favorite audio series for missionary stories are the Brinkman Adventures, and then the Christian Heroes Then and Now Series for family read alouds! Thank you, Chantel, for this wonderful article! 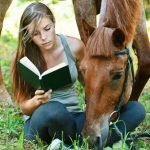 I grew up on the Trailblazer books, but all the rest of these are mostly new to me–though I’ve added a few of the Christian Heroes Then and Now books to my shelf since childhood. Thanks so much for all these great suggestions for my childrens’ wishlists! Thank you so much for these terrific recommendations, Chantel! I grew up reading missionary stories and I can tell you, they had a tremendous impact on my heart and life (like you, it sounds). The people I read about inspired me for many years to come– and continue to do so, I should add! Yes! I agree that their legacy and inspiration is something that I continue to draw from, possibly more so as an adult than ever!